Over the land of Morenia, dark clouds are forming, and flowers, trees and grass are changing to ash. A young peasant boy, Aragel, finds a hidden letter from his dead father which describes the Forest of Axter, the most beautiful thing he has ever seen and a sight which had made him feel a happiness he had never known before or since, adding mysteriously, `even the dark clouds could not resist their power.’ Is the mysterious forest the key to fighting the curse which has overcome Arya? Aragel intends to find out. So begins a journey which takes Aragel to the caves of the Skeleton King and over the Crystal Mountains to a place where he hopes to discover the answer to his quest, and find the mysterious Forest Nymphs. 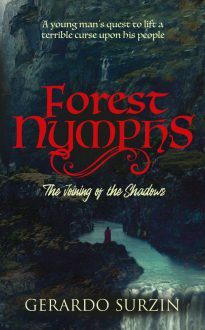 The second and concluding part of the story, Forest Nymphs: Into the World of Shadows, will follow shortly.